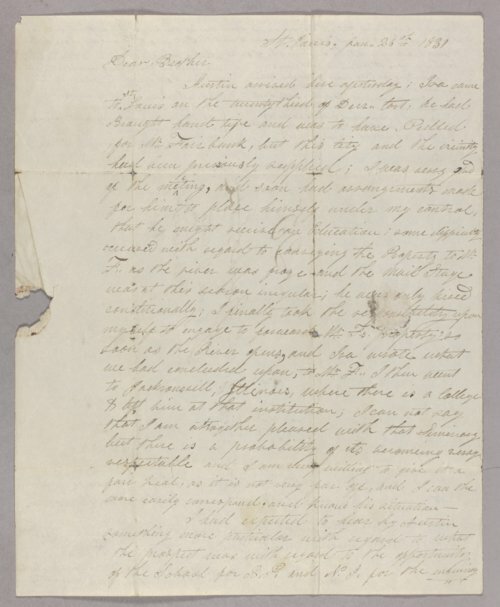 This letter is from Jedidiah Strong Smith (1799-1831) to his brother Ralph Smith (1794-1867) who was living in Wayne County, Ohio at the time of the letter in 1831. This letter is written from St. Louis, Missouri months before Jedidiah Smith was killed by Comanche Indians in May of 1831 on the Cimaron Cutoff of the Santa Fe Trail near the Cimarron River. In the letter, Jedidiah writes about his travels and people he encounters and interacts with including children and doctors.